This course will offer an intensive, guided introduction to major movements and figures in literature since 1900 set in the context of the past century's serial revolutions in art, science, music, philosophy, religion, economics, and politics. 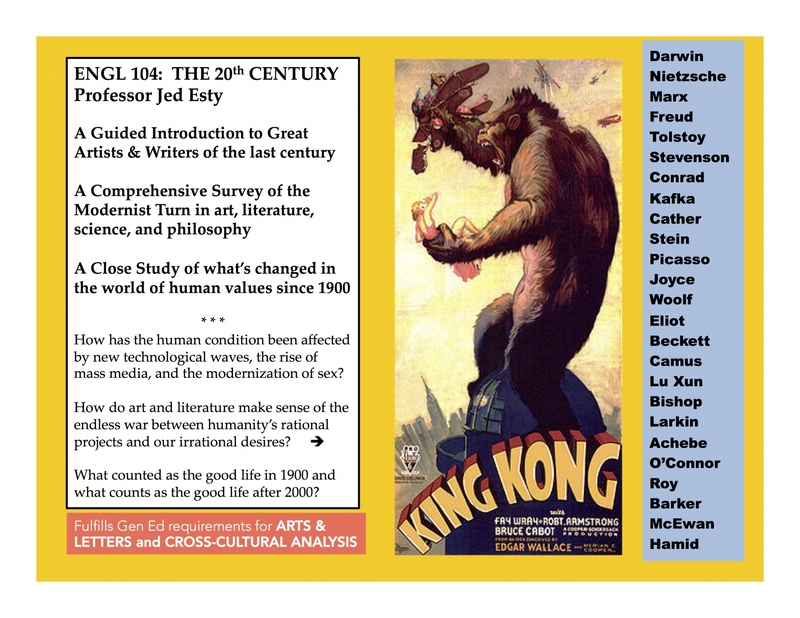 The course begins by considering the transformative effects of Darwin, Marx, Freud, and Nietzsche on prevailing concepts of human nature and historical destiny, and by exploring two short masterpieces of the nineteenth-century, Stevenson's Dr. Jekyll and Mr. Hyde andTolstoy's Death of Ivan Ilych. We will then pursue several opening themes -- the specter of war and dehumanization, the rise of the professions, the divided psyche, the urban jungle, the war of the sexes, the growth of machine society, and the explosion of mass media -- through the work of several landmark modernists: Kafka, Yeats, Eliot, Cather, Joyce, and Lu Xun (whose 1922 novella The Real Story of Ah Q registers many of these themes in a Chinese setting). Poetry and short fiction will be complemented by one full-length novel (Woolf's To the Lighthouse) and by background lectures in social history and the visual arts. In the second half of the course, we will track the same central themes over the dividing line of 1945. Along the way, we'll investigate the aftermath of World War II in new moral realisms (Orwell, O'Connor), Cold War existentialism and absurdism (Camus, Beckett), poetry's return to lyric or confessional intensity (Larkin, Bishop), and the history of decolonization (Achebe). Finally, we will conclude with a series of contemporary global fictions that bring the central concerns of the course into the present: Pat Barker's Regeneration, Ian McEwan's Atonement, Arundhati Roy's The God of Small Things. and Mohsin Hamid's The Reluctant Fundamentalist. Fulfills both the Arts and Letters and Cross-Cultural Analysis requirements of the College's General Education sequence, as well as Sector 2 or 6 of the English Major. English 104.403: Natalie Amleshi, office hours in FBH 331. English 104.404: Julia Cox, office hours in FBH 331. English 104.405: Daniel Davies, office hours in FBH 315. English 104.406: Jazmin Delgado Flores, office hours in FBH 238. English 104.407: Keyana Parks, office hours in FBH 238. English 104.408: Brooke Stanley, office hours in FBH 340. English 104.409: Hao J. (Howie) Tam, office hours in FBH 340. English 104.410: Orchid Tierney, office hours in FBH 238.